Free until level 20 that is. 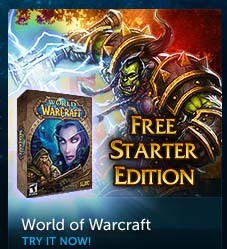 Does Blizzard really think that this will help revive their digital stranglehold on the world of MMOs? Seems like a desperate move to me. What would it take to get you back to playing World of Warcraft? For me, right now, the only thing that could get me back into that game would be friends playing it again. That and knowing that I’d be able to play with them regardless of the time difference. Will admit though that playing this game again would feel like taking two steps back for some reason. I honestly don’t think I could go back. I’ve peg holed it with such negative feelings that I would first need a reason to make it beneficial to my real life. Right now, I just don’t see how it could be. I know my schedule now. I’ll never have hours per week to sit down and play it and so even with friends on there it would have to be something we do once a month maybe, and I can’t even really see pulling that off. Combine that with the monthly fee and there’s no way I’m paying 100 bucks over the next three months to hang out with some friends for 3 or 4 hours. For me to play WoW again? It would take the promise that my group of friends would all commit to playing it together again. That’s where the enjoyment is, playing with friends. There might come a day when one of you guys will announce you are playing WoW again…and I will feel that familiar pull to play…but I think something else will finally come along that will be much better. Diablo 3 perhaps? I’m always up for some Left 4 Dead 2 🙂 Nothing like immediate zombie-killing gratification with friends. World of Warcraft burnout seems to run deep amongst my friend pool. Quite simply, all of our lives have changed since the game launched back in 2004. Many of us are now married, have moved onto other games, and have been overwhelmed with life responsibilities. As good of a time I had in Azeroth, I just don’t see myself going back. Why visit a place where your friends no longer reside? Why return to a world where everyone doesn’t know your name? MMO’s are time-sucking-vortexes that I simply do not have time for anymore. While I still enjoy reading about them, I feel that the genre as a whole has not advanced forward. World of Warcraft is the pinnacle of modern MMO gaming. Games like RIFT, though polished, offer me nothing compelling to forget about World of Warcraft and move forward. I do hope that Star Wars: The Old Republic and Guild Wars 2 do something to shake up this genre funk. I miss playing a good MMO. Until that day, MMO’s like RIFT have been banished from my computer. Case closed.